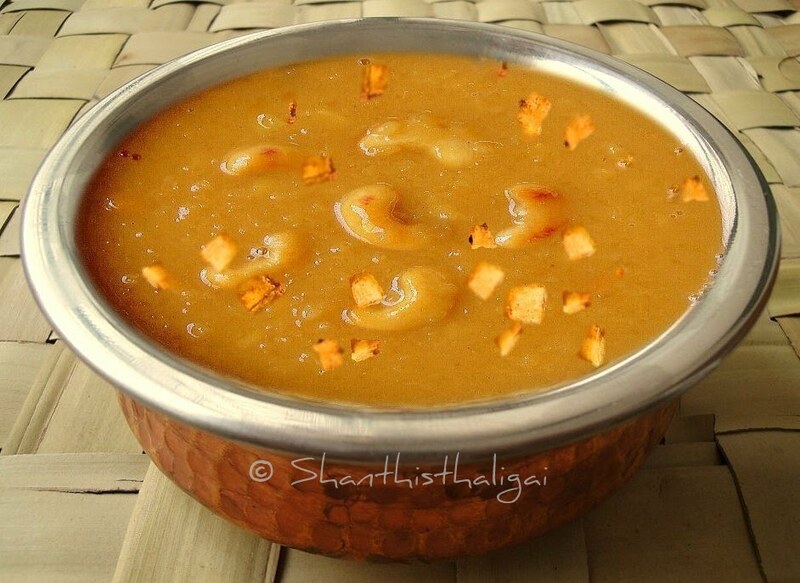 Parippu pradhaman is a kheer/payasam served in the traditional Kerala Onam Sadya. Scrap the coconut and soak in 1 cup of hot water for 10 minutes. Grind it in a mixie. Squeeze and extract milk. This is the first extract of coconut milk, which will be thick. Keep aside. Repeat the procedure two more times. Keep the second extract in a separate vessel and third extract separately in another vessel. Meanwhile, crush the jaggery and dissolve in half a cup of water. Filter the impurities. Fry the cashews and coconut pieces in a teaspoon of ghee. Powder the cardamoms. Dry roast moong dhal, when cool, wash well. In a heavy bottomed kadai or uruli, cook washed moong dhal alongwith water until soft. Mash well. Now add the jaggery solution and allow it to boil until the raw smell is diffused. Add ghee. Stir well. Pour the 3rd coconut milk extract, stir in between and allow it to boil till everything is blended well and little thick. Now add the 2nd extract and allow it to boil until the mixture thickens. Meanwhile, add powdered cardamom to the first extract of coconut milk, mix well, keep ready. Add the 1st thick extract. Stir well. SWITCH OFF THE STOVE, REMOVE FROM FIRE. Add ghee-fried cashews and coconuts. Add the remaining ghee if any. Serve warm or hot. Kerala special parippu payasam / parippu pradhaman is ready. NOTE: You can add coconut milk to get the desired consistency.